"On 17th May, 1944 two companies moved forward to Mile 33 on the Imphal-Tiddim Road to secure a road block position in that area. B company was operating on the East of the main road and located an enemy position with many bunkers. The leading platoon attacked and cleared the outlaying bunker area and on reaching the nala came under heavy machine gun fire from three enemy tanks which were harboured there. Rifleman Ganju Lama was No.1 on the PIAT (projector infantry anti-tank) attached to the forward platoon and on seeing their difficulty immediately stalked forward and secured a position for his weapon, although by this time the enemy tanks had opened fire with H E from their 37mm Guns, Rifleman Ganju Lama then opened fire at 60 yards range and with his second bomb scored a direct hit on a tank which was later seen to be on fire. The platoon was later recalled on orders from the company commander and Ganju Lama remained to cover their withdrawal. Throughout this action this rifleman displayed remarkable resource, coolness and entire disregard for his personal safety, setting a high example to all in his vicinity". Dated 5th of October, 1944. The Government of India also recognized the valour of this gallant by appointing Ganju Lama as an ADC to the President of India in 1964. He got his retirement from the said post in 1972. The Government of Sikkim has renamed the Ravangla- Tarku Road as Ganju Lama Road. 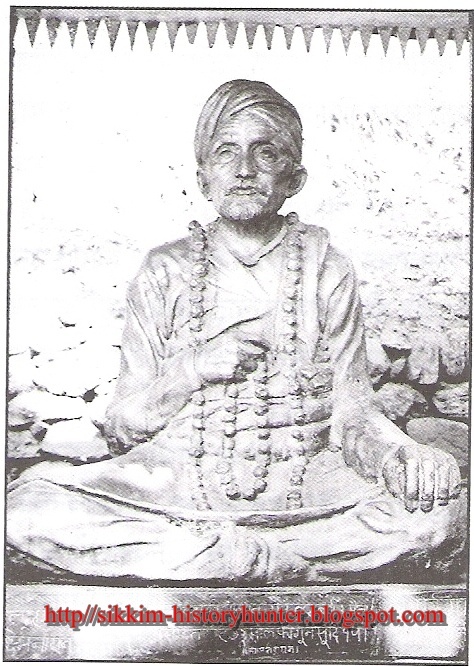 Kashiraj Pradhan was born on 11th December 1905 at Pakyong in East Sikkim. His father Kaluram Pradhan was an innovative and an audacious individual and his mother Bhadralakshmi Pradhan was a religious and well-mannered lady. The family of Lt. Kashiraj Pradhan was accountable for the economic growth of Sikkim with their innovative ideas. His grandfather Lt. Chandrabir Pradhan popularly known as Chandrabir Taksari or Chandrabir Maskey, along with few other Newars had taken the initiative of issuing copper coins in Sikkim. Earlier, there was the influence of Tibetan coins in Sikkim but, after the coming of the British in India Sikkim had the circulation of East India Company coins. For the process of issuing own coins of Sikkim they had taken their permission from the Sikkim Durbar and started exploration of copper at Sadam, Chakhung, Motang (Pandam) and Pachey. For the introduction of copper coins in Sikkim which was exclusively made by them, the family of Lt. Chandrabir Pradhan is also known as Taksari (meaning a person who mints coin). The greatest contribution of the Taksaris of Sikkim is the construction of a cart road from Teesta to Gangtok. They also played a crucial role for setting up of markets in different parts of Sikkim. Today’s Singtam, Rongli, Rangpo and Pakyong Bazars were established due to the determined exertions made by the families of Lt. Kashiraj Pradhan. In 1930, Kashiraj accomplished his Graduation from the esteemed Calcutta University. 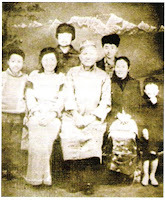 He was also the second graduate from the kingdom of Sikkim. The first person to become a graduate was Hari Prasad Pradhan. After his studies, Kashiraj entered into a teaching job at Sir Tashi Namgyal High School Gangtok where he served till 1947. 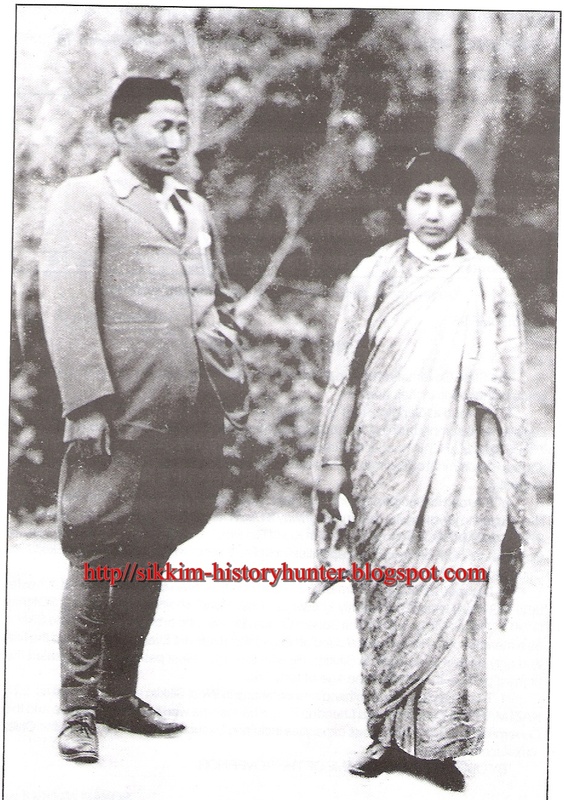 In 1949, he was elected as a Cabinet Secretary with this appointment, Kashiraj entered into the politics of Sikkim. In the first General Election of 1953, Kashiraj Pradhan made an overwhelming victory and was elected as the Leader of Parliament Board. He was also nominated as an Executive Councilor in the Sikkim Durbar. Kashiraj had been given the charge of Education, Public Works, Excise and Tourism in the Sikkim Durbar’s Executive Council of 1953. With his victory in the Second General Election of 1959, he was appointed as Senior Executive Councilor by the Sikkim Durbar. The greatest contribution of Lt. Kashiraj Pradhan to Sikkim is the introduction of journalism. In that period there was no newspaper in the entire kingdom. To fill-up the inadequacy in the political process of Sikkim the publication of a monthly Nepali journal ‘Kanchenjunga’ was started on 15th August 1957. The editor of this journal was Nahakul Pradhan but, the entire important workout for the publication of 'Kanchenjunga' was completed by Mr. Kashiraj Pradhan. It is to be noted here that 'Kanchenjunga' was the first news based journal of Sikkim written in the language of the majority i.e. Nepali. Before he commenced the publication of Kanchenjunga, he gathered enormous experience as a reporter in Gorkha Sansar (A Nepali journal published from Dehradun) and Hindustan Standard an English Newspaper published from Calcutta. In this aspect Kashiraj can also be regarded as the first journalist from Sikkim. For his involvement in the field of journalism and his dedication for the development of the kingdom of Sikkim, Palden Thondup Namgyal, the last Chogyal of independent Sikkim has awarded him the highest Civilian Award of the Kingdom “Pema Dorjee” on 4th April 1972. In recognition of his contribution especially in the field of Nepali Literature and journalism in Sikkim, the Sikkim Sahitya Parishad, an eminent literary organization of Sikkim, has awarded Kashiraj Pradhan with the prestigious Bhanu Puraskar on 13th July 1985. (Picture on the top -Kashiraj Pradhan with his wife Lakshmi Devi Shrestha. The word Kanchenjunga is derived from the Tibetan words Kanchen and Dzonga meaning five treasuries of snow. It is engirdled by three countries Sikkim in the south and east, Nepal in the west and Tibet in the North. The people of Sikkim worship the deity known as Khanchenzdunga. The festival is known as Tendong Lho Rum Faat by the Lepchas of Sikkim. The Lepcha tribe of Sikkim is affluent in folk tales. According to an anecdote customary among the Lepchas that the Kanchenjunga Range has raised from the horns of a deity which led for a massive flood in Sikkim. Therefore, to save themselves from the catastrophe, the Lepchas had taken their shelter in the high peaks of Tendong and Mainam. In the Lepcha Mythology, Kanchenjunga is spelt as Kong- Lo- Chu. They worship the peak as a God and on the third Moon Month every year; they celebrate a festival in reverence to the Lord Kanchenjunga. They make a model of the Mountain in facade of their homes and worship it. It is exclusively made of nine stones and the people dance and sings with mask to get the blessings of the Lord. There is a belief among the Lepchas that the well wishes of the Lord are indispensable for keeping them wealthy and healthy. There was no permission to get to the top of the Mountain because it is believed that the Supreme resides in the topmost peak, and if anyone surpasses he will be displeased. A celebration is held every year to indicate the ascension of the Lord for the safeguard of the Lepchas. This carnival is known as the Tendong Lho Rum Faat. The festival called Tendong Lho Rum Faat is held on the 3rd Lunar Month each year at Sikkim. Although Kangchenjunga is the official spelling adopted by Douglas Freshfield, A.M. Kellas, and the Royal Geographical Society that gives the best indication of the Tibetan pronunciation, there are a number of alternative spellings which include Kangchen Dzönga, Khangchendzonga, Kanchenjanga, Kachendzonga, Kanchenjunga or Kangchanfanga. 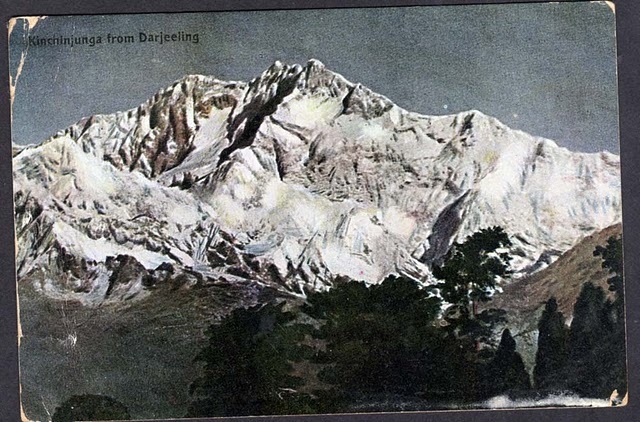 The final word on the use of the name Kangchenjunga came from His Highness Sir Tashi Namgyal, the Maharaja or Chogyal of Sikkim, who stated that "although junga had no meaning in Tibetan, it really ought to have been Zod-nga (treasure, five) Kang-chen (snow, big) to convey the meaning correctly". Following consultations with a Lieutenant-Colonel J.L.R. Weir (HMG political agent to Sikkim), he agreed that it was best to leave it as Kangchenjunga, and thus the name remained so by acceptance and usage. Until 1852, Kangchenjunga was assumed to be the highest mountain in the world, but calculations made by the British Great Trigonometric Survey in 1849 came to the conclusion that Mount Everest (known as Peak XV at the time) was the highest and Kangchenjunga the third-highest. Kangchenjunga was first climbed on May 25, 1955 by Joe Brown and George Band of a Britishexpedition. The British expedition honoured the beliefs of the Sikkimese, who hold the summit sacred, by stopping a few feet short of the actual summit. Most successful summit parties since then have followed this tradition. The division of the kingdom into several Dzongs or districts was prevalent from the early years of the Namgyal dynasty. The country was divided into Dzongs for the administrative convenience of the ruler. The territory of the kingdom in the initial years of the Tibetan Rule was a large one. Therefore, for the administration of the Tibetan Dominion of Sikkim, the kingdom was divided into several districts and the Lepcha Dzongpens or the Governors were given the charge of their respective areas. But, the kingdom had lost its territories to the Nepal, Bhutan, to the East India Company and to Tibet. Therefore, by now the total area of Sikkim was not more than the area of present Sikkim. Even in such a small area, the Dzongpens or the Governors were still enjoying their privileges which they had inherited from their forefathers. As time rolled on, the same Lepcha Dzongpens became the Kazis. (The term Kazi might have been borrowed from neighbouring Indian Muslim state or from Nepal). Their matrimonial relations with the Tibetan nobility made them to hide their origin as the Tibetans considered the Lepchas as the low-born people. With the arrival of the British, these Kazis, because of their money and power which they imitated from the British, became more rigid and rude towards their own people. The Kazis before their contacts with the British were not cunning enough as they lived in a kingdom which was secluded and unknown to the outside world. “The Kazis, who are the landlords, claim to belong to the old nobility and compare themselves with the barons of the feudal system. By long usage they have accustomed to oppress the people and to expect the utmost subservience from them. They form the exclusive and influential coterie around the ruling family and are able to impose their will on all and sundry. The rest of the land lords called ‘Thikadars’, are content to play second fiddle to the Kazis and thus share in the loaves and fishes of office and other privileges. Bound by a common policy to oppress the ryots, the ‘Thikadars’ especially the more influential among them, have proved as bad as any of the Kazis. Landlordism as obtaining in Sikkim has proved the curse of the ryots. It has enabled the landlords through coercion and intimidation, to acquire for themselves the best holdings of the ryots. The landlords pay no taxes, which consequently fall with greater severity upon the ryots. On the other hand, the landlords receive large unearned commission from the state as reward for carrying on a thoroughly corrupt system of government”.